My father liked to make up words. He once had a rabbit named "Razbucknick" and a cat named "Kyteen", a play on the words "rabbit" and "kitten", and when he was young he christened my grandparents' bathroom cabinet "The Cabinet Of Reckstedable Needs". If you ever had seen this cabinet you would understand how appropriate the name was. My grandmother was a genius at organization and she got involved with their house before it was entirely finished and directed some brilliant changes in the design. Instead of a soffit over the kitchen cabinets she added smaller cabinets. A pony wall by the front door became a planter/cupboard. The coat closet was expanded to the entire length of the central hallway, and in the bathroom was added the Reckstedable Needs cabinet. I would love to have such a cabinet in my house! It was floor-to-ceiling blond wood with shelving inside to keep everything organized and one side of it was open on the inside to the basement laundry room, so it acted as a laundry chute as well as storage for almost all the linens, towels, medicines, and toiletries used by the household, all in an extremely compact area. I suppose "Reckstedable" is a combination of "wreck" and "indispensable", not that any of my grandmother's cupboards were wrecks when I knew her. I always think of her when I visit IKEA. I suppose when her children were young it was a different story. At any rate, I think reckstedable is a good word to describe a great number of unrelated but necessary items, and this post will cover a great many of such reckstedable things. 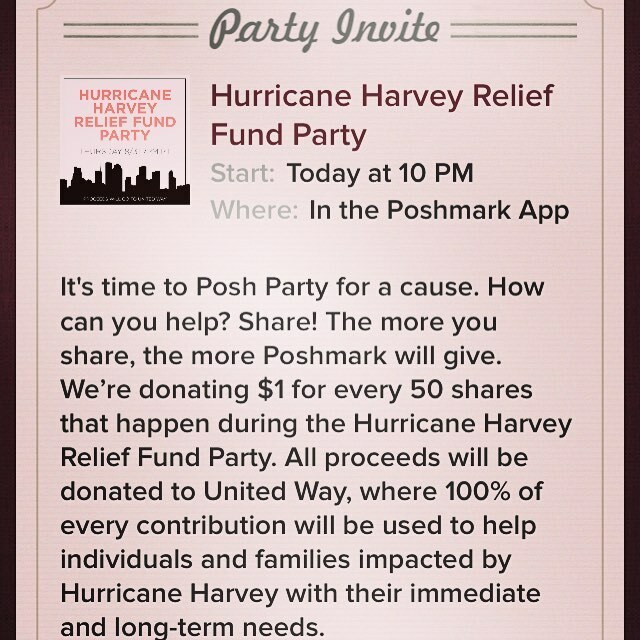 First, and most importantly, I implore you to join me on the Poshmark app tonight, 8/31, at 10PM Eastern Standard Time for the Hurricane Harvey Relief Party. 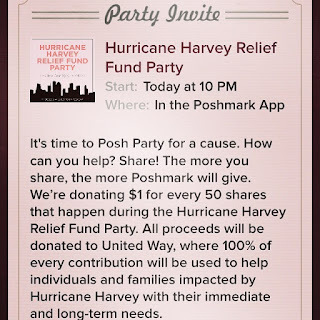 Poshmark will donate $1 for each listing shared during the party. All you have to do is share to help the victims of Harvey via United Way! Since you will probably find a great deal on fashion, sign up using the code NLBOW when you download the app and you will get a $5 credit. I would like to direct you also to eBay and the Young Living Foundation because both are matching donations made to specific organizations for Harvey relief. I was able, thanks to my customers, to make a donation already and since I did it through eBay my contribution has twice the impact. 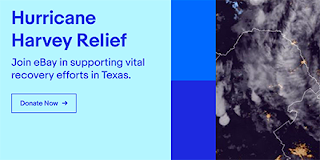 So, thank you very much for allowing me to donate! 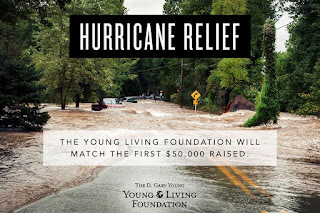 I hope you are able to take advantage of these donation-matching programs. There, but for the grace of God, go we. Second, I wanted to share a recent success in the essential oils department which you might find helpful. My youngest son was scheduled for a routine oral surgery in order to remove a couple baby teeth which are preventing permanent teeth from dropping down as they should. The next big part of the treatment for his congenital cleft lip and palate will be a bone graft in the area of his cleft, to provide a dental arch to anchor his permanent teeth and those teeth are delaying the essential surgery. He has had teeth pulled before while under nitrous oxide with no issues, so I wasn't worried about the procedure. However, as soon as the technician began lowering the chair, he completely flipped out. His anxiety was so intense the surgery had to be postponed. We had to go to a different surgeon, drive an hour each way, and use an anesthesiologist to put him under. This made the surgery cost $1000 instead of the $250 it would have originally. I wanted him to have the procedure before school started so I was determined he should not freak out before the second surgery. I read a magazine article a few months ago about the results of a study using tangerine essential oil. 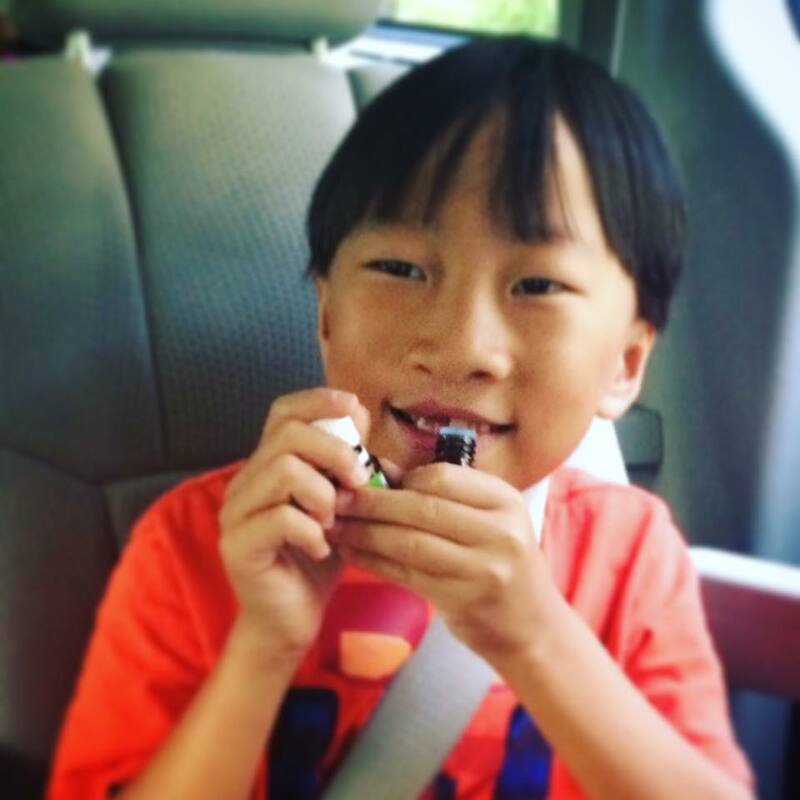 Children facing anxiety-inducing dental procedures were given tangerine oil to smell before the procedure. The oil lowered the children's heart rates an average of six beats per minute when they inhaled it. On the way to the surgeon's I had my son inhale tangerine, Stress Away, and Valor oils in turn and think calming thoughts. He went into the surgery with no anxiety and everything went smoothly, a huge difference from our first attempt! I wish I had realized the first time how worried he was; I could have treated him with oils and avoided all the extra bother and expense. I use and sell Young Living essential oils and Stress Away and Valor are Young Living proprietary blends. If you have anxiety or are about to be in a stressful situation I highly recommend these oils! 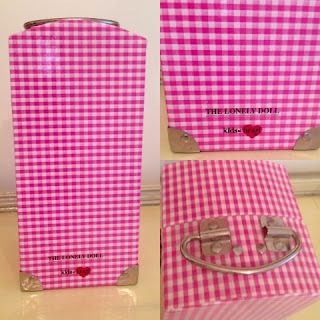 Third, and finally, I have some new arrivals in the doll department of my shops. 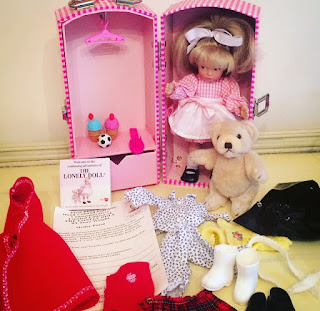 I have been working hard to get the stores stocked for the holidays, when dolls and toys are big sellers for me. The most recent additions are my Raving Beauty and Lonely Doll trunk set. I wrote blog posts on each of these restorations so you can read all about them. You can purchase them from Etsy and eBay using the links on the Atelier Mandaline website. Etsy is having their first-ever sale and my Atelier Mandaline shop is participating, so you will want to check that out! 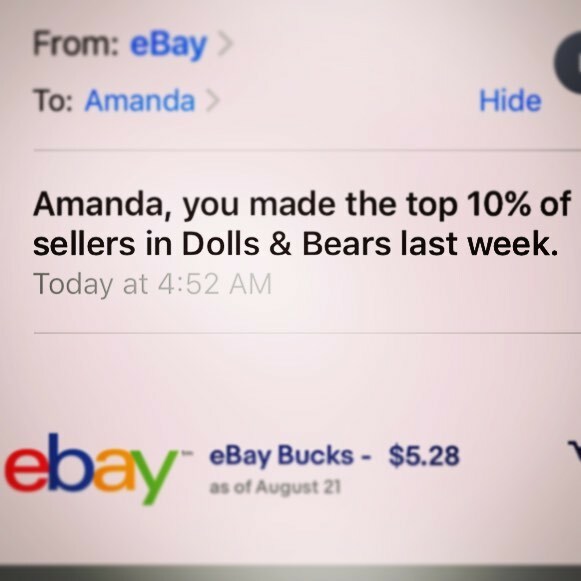 Look for extra discounts on eBay over Labor Day too. From the 1930s to the 1950s, which many refer to as the "Golden Age" of dolls, new, sturdier materials allowed girls to play with dolls much more safely and actively than the bisque and porcelain dolls of the previous generation. Doll and toy makers utilized composition and the new hard plastics to create large dolls sculpted to look like children. Little girls could be either a mother or a friend to their new doll, who looked and dressed just like them. 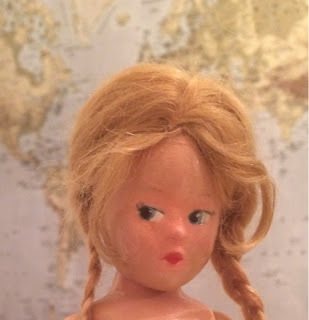 When synthetic hair fibers were invented dolls could also have their hair "permed" and styled just like their little mommy's. 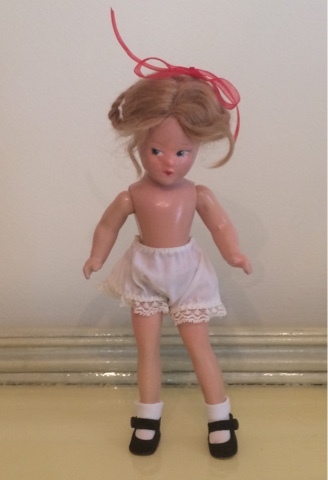 Just after this era, miniature dolls and then adult-figure fashion dolls took over the market. 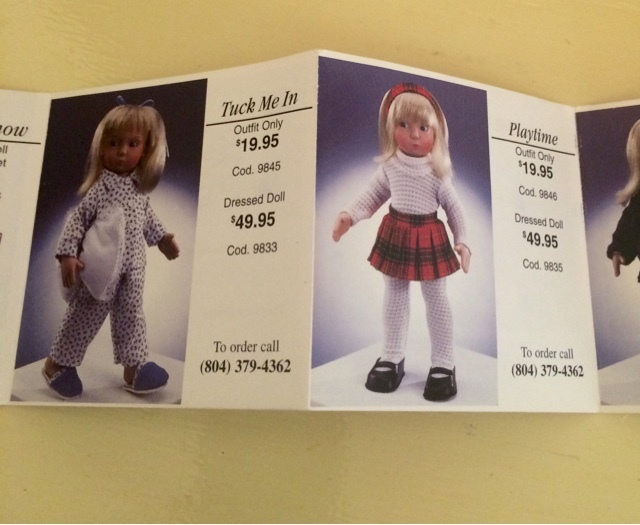 Ordinary girl dolls were not to come back into fashion in any great way until the American Girl doll made her debut. 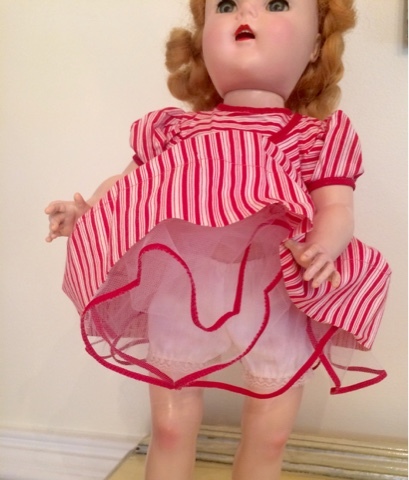 This doll, Raving Beauty by Artisan, is typical of the original "American girl" doll type. This one dates to the early 1950s. 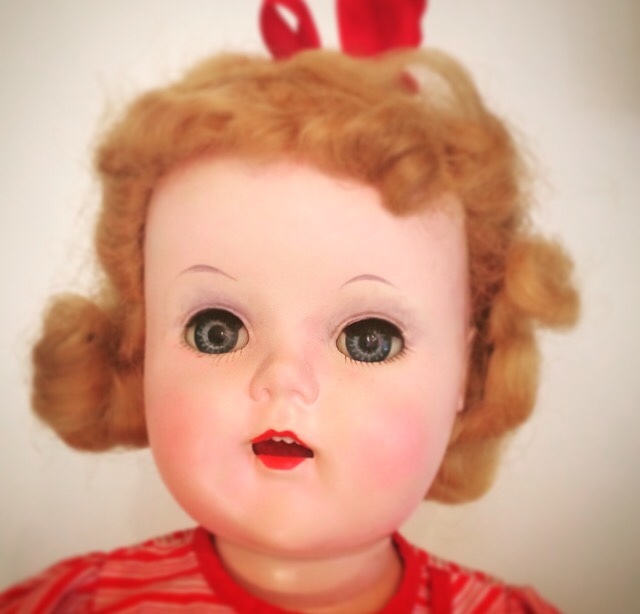 Raving Beauty is what is often referred to as a "grocery store" doll. 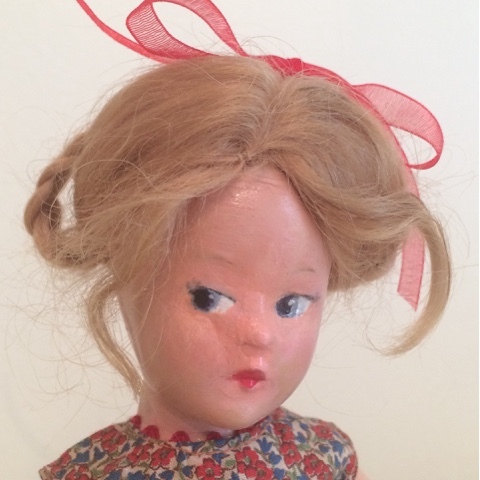 Grocery Store dolls were made in smaller quantities by lesser-known manufacturers and sold for an economical price at grocery stores or local department stores. 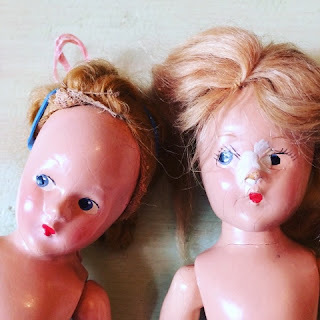 They were not quite as cheap as gas station or dime store dolls; these were middle-of-the-road dolls most girls ended up owning. 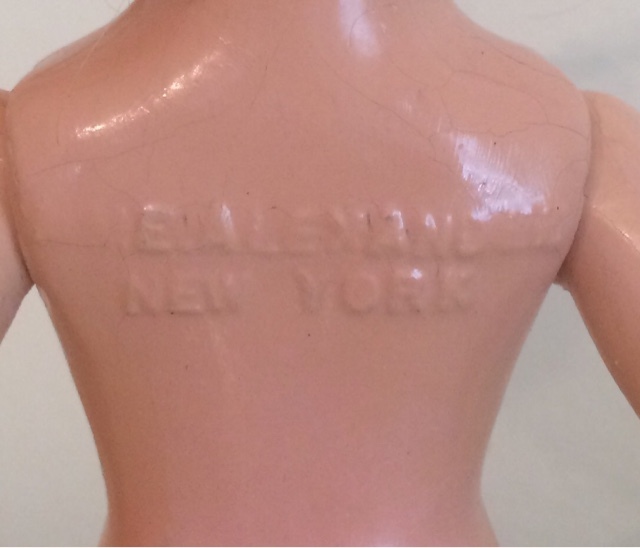 Artisan released Raving Beauty as a more affordable option to compete with Ideal's Posie, Toni, and Betsy McCall; American Character's Sweet Sue; and Madame Alexander's Maggie and Margaret dolls. Raving Beauty does have a lovely face, almost identical to the Barry Baby doll face, but Beauty is unmarked and Barry Baby is marked with a number. Beauty arrived at my house needing the typical repairs: stringing, hair styling, cleaning, and paint touch-ups. I made all the necessary repairs and found a dress for her similar to what she would have worn. I painted over some chips on her face and re-blushed her cheeks and eyeshadow, but otherwise she is all original, with her factory painted and "real" lashes, eyes, and wig. 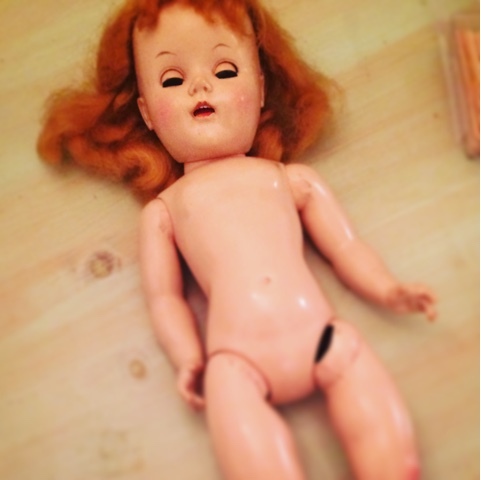 I haven't worked on this doll before and I discovered she's rather hard to string. Something about the way her leg bars are attached doesn't let them get really tight. I am stringing just as her original bands were done and her legs were loose then too. I re-strung her twice using two different width elastics. She is able to pose and stand now but still she's more loose than I would prefer. 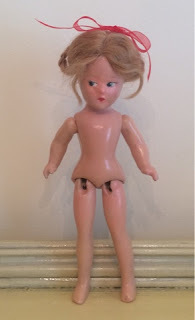 I have learned over the years, however, that working against the doll's anatomy in stringing only leads to splits in the plastic, so I forced myself to declare her finished. Like the Toni doll I restored a few months back, this doll had a lot of frizz and breakage to the ends of her hair. Most Raving Beauty dolls had really elaborate hairstyles, with Victory Rolls and a thousand hair pins. I could see this one was similar because her hair was oddly cut. It is really long on the sides, then short, then longer again in the back. I am fairly certain the long sides were pulled up on top of her head so that's what I did. I pinned the curls short to hide the fuzzy ends. When the doll first arrived and I washed her hair I was really impressed to see the true color. It's an unusual strawberry blond, or what you might call a true ginger, very light red. My cousins have four little boys who all have this color hair, but it's rare to see it on humans or dolls! I decided Beauty needed a really full crinoline so she would epitomize the fifties fashion, so I made one. 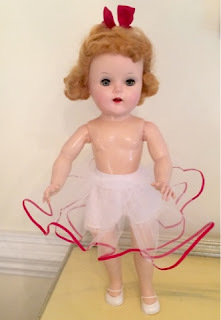 It is white tulle trimmed with red middy braid, meant to peek out from under her skirt. Square dancing is a really big deal in Ohio, where I spent my elementary school years. Every country wedding has, or used to have, a big square dance afterward and on the weekends there are always big dances at the Legion or the Rural Hall. I desperately wanted one of the square dance dresses with the big fancy crinoline like this underneath! I am living vicariously through my dolls! Raving Beauty turned out to be a very lovely girl, you might even say a "raving beauty"! She is a perfect addition to a Midcentury doll collection and a wonderful gift to show a child what an "American girl" doll was to begin with. 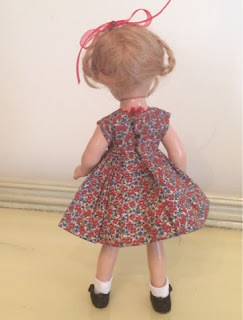 As always, to buy Raving Beauty or any of my dolls please link to my shops from the Atelier Mandaline website. 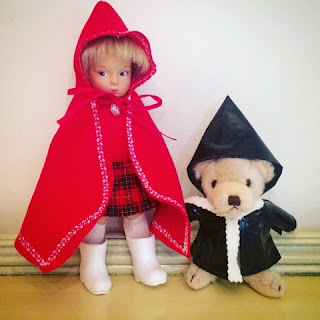 Many of you know of my obsession with The Lonely Doll and other books about Edith and the bears by Dare Wright. 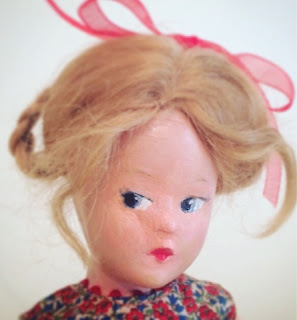 The very first post on this blog was about an Edith replica I created! As a child of ten, having moved to the South from the Midwest, finding myself completely out of my element and alone, I sought refuge in the library. The library just happened to have a book called Edith and Midnight. The book is about a doll and her horse. Horses were already a major obsession of mine and one of the greatest sorrows of my young life was leaving our horse, Ginger, in Indiana with my aunt while we moved to North Carolina. My mother doesn't like horses or farms or anything of that nature, so she had no interest in allowing us to keep our horse (or my rabbit, Fluffy, who I was also forced to give to neighbors. My parents really knew how to make a move agreeable to a child!). Ginger was an incredibly gorgeous Tennessee Walker, chestnut with a white blaze on her forehead and a lot of attitude. So, when I found a book illustrated with photos of a doll taking care of a horse, I was hooked. Dare Wright was an incredible photographer, and she makes Edith and the bears look alive. 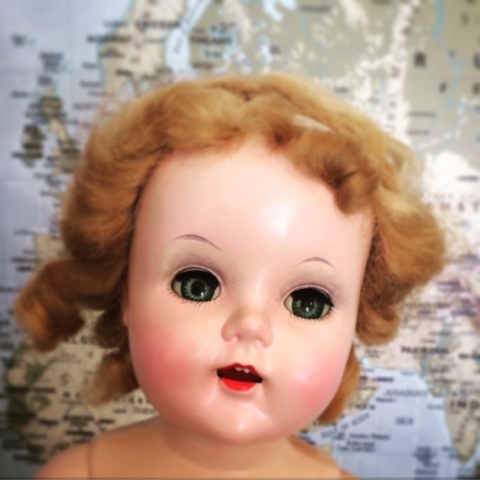 I had never seen another doll like Edith. She was Wright's childhood Lenci doll, one of the big 20 inch ones, made of pressed and jointed felt. The bears in the book are antique Steiff bears, also jointed. I quickly located and read as many of the books as I could find. Sad to say, in the bustle of life, I forgot all about Edith until one day I found a re-printed copy of The Lonely Doll at a consignment sale. I snapped it up for my daughter. I went on to collect all the books, except Big Bad Bill, even the newest one by Dare Wright's niece or somebody, although that one has none of the magic of the originals. I also bought my daughter the large Edith felt doll by Rothschild and the Edith trunk set by Kids At Heart. 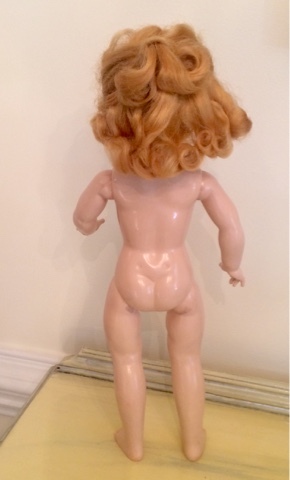 The trunk set features a 10 inch Edith doll sculpted by Martha Haut Melton. Melton made a larger replica felt doll, but that one sells for about $1000, so it is out of my price range, especially for a play doll! 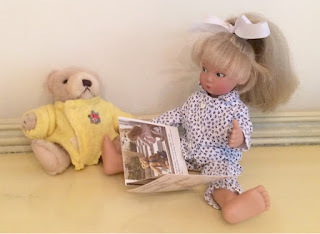 I read all the books to my daughter and collected and sewed clothing for Edith and Little Bear... and she could quite frankly not care less! Now she has outgrown dolls. With our recent spate of air conditioner and surgery woes I decided we need the money and that I could stand to let this set go. It's not easy, I admit, but I comfort myself I can find another if we ever want to replace it; that's the great thing about the Internet! Nothing is ever lost! 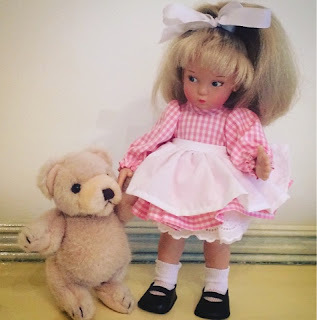 Edith is jointed vinyl and Little Bear is jointed plush. 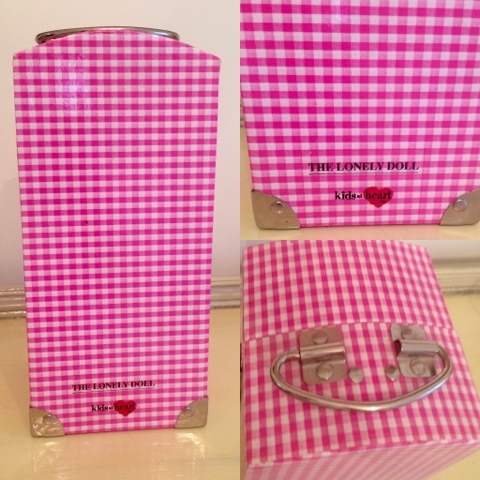 The storybook is one side, the catalogue the other side. The trunk has minor marks from play. It's not to say my daughter never, ever played with this set; she did some. 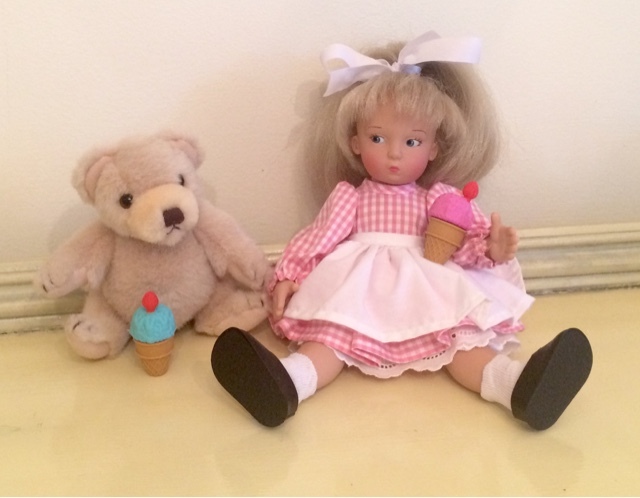 She especially loved puzzle erasers, and they are the perfect size to use as accessories for this doll. Edith and Little Bear have rubber ice cream cones and a soccer ball. The Playtime skirt with a handmade bodysuit. Handmade and vintage winter gear. The Tuck Me In pajamas and a possibly handmade vintage sleeper. The expressive nature of the Melton sculpt allows you to imagine Edith in all sorts of situations. She's a comfortable size for children and her large feet make her easy to balance. She was made in 1997, so she probably still meets standards for play, but it is worth mentioning this is a fairly rare doll, and some of the pieces, like the trunk, are extremely hard to find. This set should only increase in value as the years go on, but I have to stop writing about it or I will talk myself out of selling it! 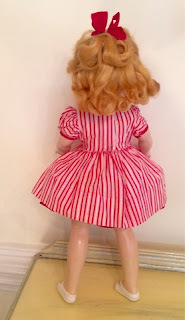 You can find Edith and many other dolls and trunk sets in my shops when you link from ateliermandaline.com. Original, vintage and handmade clothes with extra shoes. 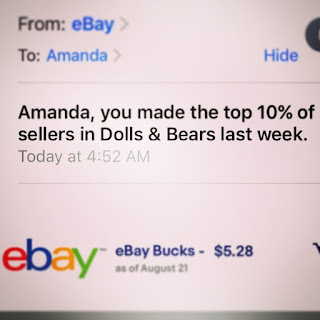 I'm proud to say, despite being out of the shop quite a bit for my son's surgical schedule, I managed to make the Top 10% of sellers on eBay again last week! That's three weeks in August if you're counting. I also finished more doll restorations I just haven't had time to write about, so there's a lot of new inventory in my shops right now. I've heard from several customers who are already shopping for the holidays so I know some of you are looking for Christmas presents already. I've got you covered! I am offering 30% off the eBay and Etsy shops this weekend only. The eBay sale starts later this afternoon. On Etsy use the code 3WEEKS for 30% off any order. Both sales end Sunday at midnight. Use the links on the Atelier Mandaline home page to check out the sale! 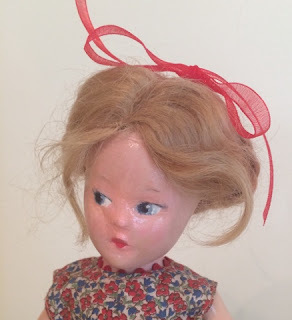 My recent doll restorations have involved a number of composition dolls from the 1930s. 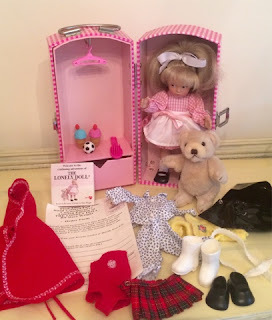 As I mentioned in my McGuffey Ana post, I had forgotten all about a box of small "Little Betty" or "Wendy Ann" dolls with clothing. McGuffey Ana was a quick and easy restoration and I listed her as a trunk set with the original clothing in the lot. The other doll in the box was quite a bit more difficult. 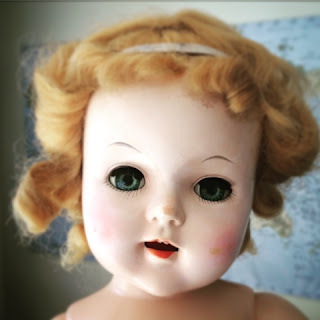 I think she is probably the reason I put the lot away and forgot them; I was nervous about whether I could even repair this doll. 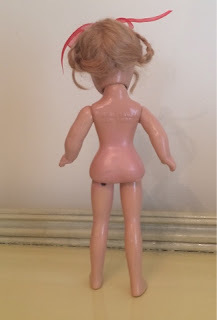 As you can see, Betty was in far worse condition of the two dolls. McGuffey Ana's wig was still in its original style, so it was easy to identify her and match her to the correct clothing. 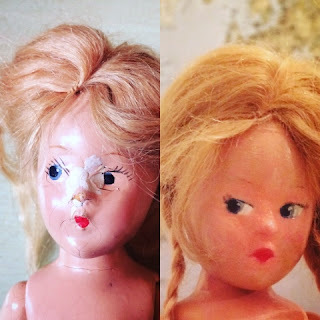 Betty's face was almost entirely missing. 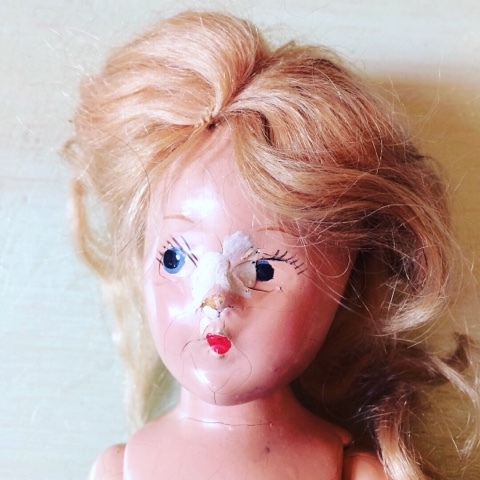 One eye was chipped away, as was her nose. The other eye had deep lifting. I had to rebuild her face as best I could with epoxy. I used acrylic varnish to seal and smooth down the lifted areas. Then I re-painted the face and sealed it with gloss varnish. I also repaired all-over crazing to her composition body and head, re-strung her, and styled Betty's mohair wig. I just guessed at Betty's hairstyle. I can see she is either Tiny Betty or Little Betty and not Wendy Ann because her back is not marked Wendy Ann. Tiny Betty is usually a 6-7 inch doll with painted shoes, but sometimes this doll is also called Tiny Betty. 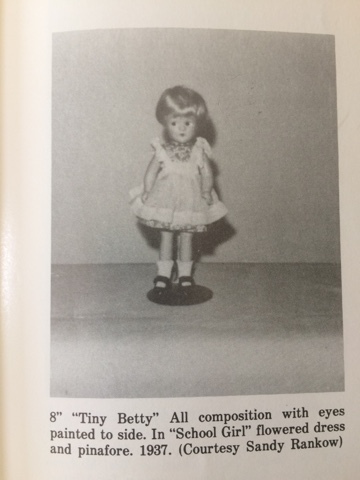 My Smith reference books show a doll who appears to wear the same dress called "Tiny Betty Schoolgirl" of 1937. I decided the schoolgirl dress probably came on this doll. 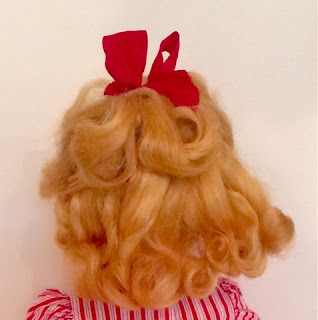 Betty's wig looked like she originally wore braids as it is stitched up the back. Her hair definitely isn't the short cut shown in the book. 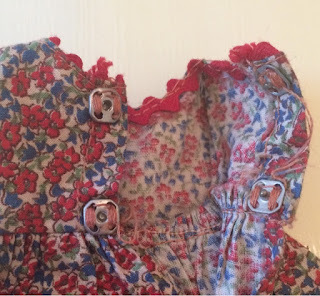 I have seen larger McGuffey Ana dolls from this period wearing dresses made from the same calico fabric as this dress, but the McGuffey Ana style is different. I decided on a braided crown hairstyle for Betty. I wore my hair like this to school a great deal as a little girl and it helps hide the fact that Betty's wig had quite a bit of hair loss. Besides the calico dress Betty had a pair of handmade tap pants in her box, but unfortunately these are too tight in the waist for her. I got some more modern (but still vintage) Madame Alexander bloomers, socks, and shoes from my stash for her. The calico dress lost its tag, but you can see from the square silver snaps and the tiny rickrack trim it is certainly an Alexander piece. This construction is typical of the Alexander clothing. 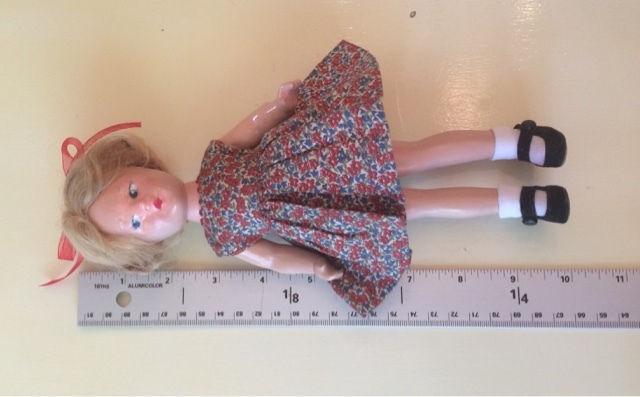 The doll is about 10 inches long. Although Little Betty is referred to as an 8 or 9 inch doll in reference books she actually measures about 10 inches. 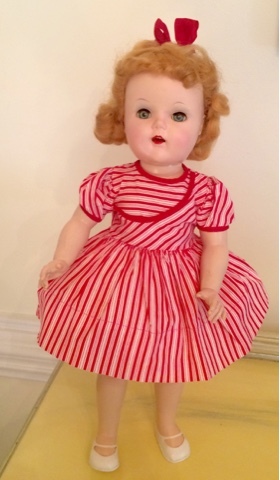 This face came on a smaller size doll as well, usually called "Tiny Betty" (but not always; it's very confusing!) 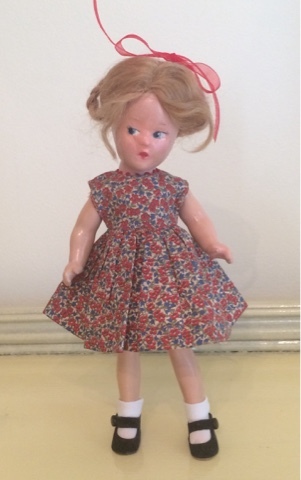 and that one has painted shoes and looks a lot like the Nancy Ann Storybook dolls. I am proud of my restoration of Betty's face, but there's no doubt the repairs are still visible. I just wasn't able to get the face completely smooth again. 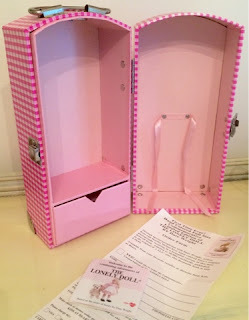 It certainly isn't terribly obvious when the doll is displayed on a shelf or in a case, but since it is there this is a great opportunity to get a highly-collectible doll at a lower price point than you might expect. 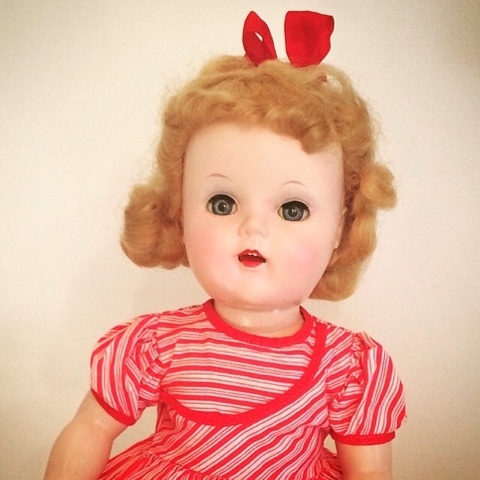 I think of Betty as a custom doll or art doll. She's an expression of my interpretation of the Betty character. 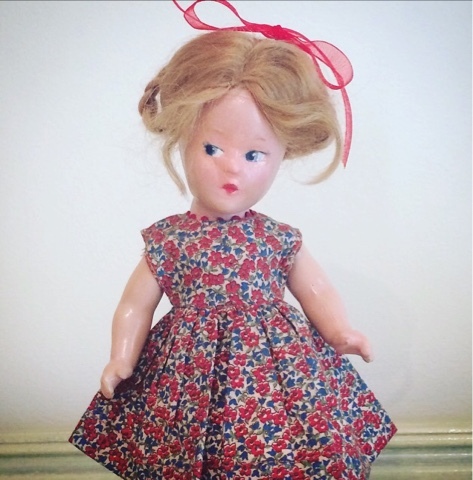 Betty, just like the later plastic Alexander Wendy-Kins toddler dolls, has a pouty face and tilted head. Ever since Madame Lenci introduced her "grumpy" toddler dolls, doll makers across the world began sculpting their toddlers with a bit of attitude. 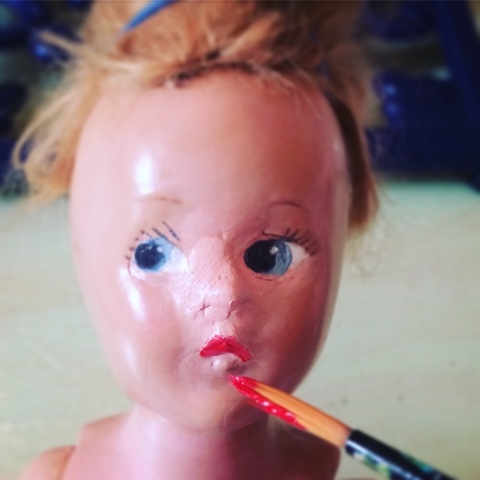 You can see most doll artists were also mothers! My Betty is all ready to go back to school. She's wearing a lovely new dress, her hair is beautifully coiffed, but she's not too sure if she's happy about the situation. I can remember the nervousness of confronting a new classroom and new teacher and sometimes even a whole new school all too well! 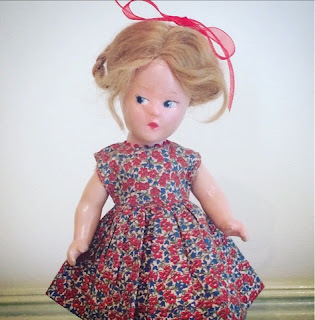 You can find Little Betty and many other lovely dolls in my shops and you can connect to all those from ateliermandaline.com. Betty is ready for school.